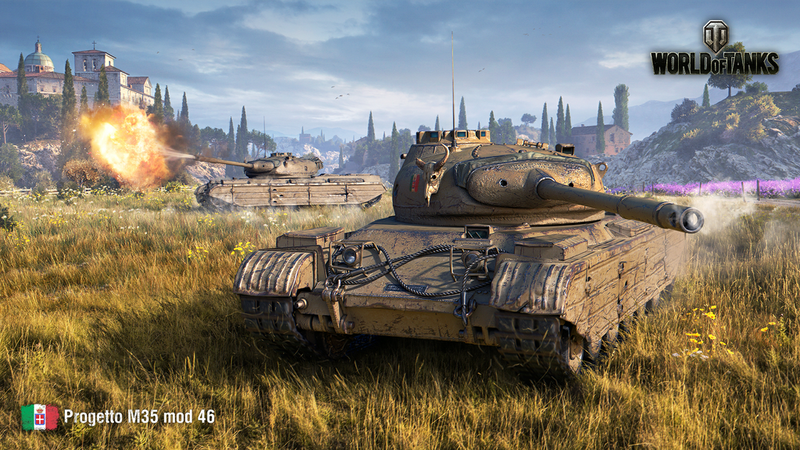 As announced yesterday, players from EU, NA and APAC regions will have the opportunity to get the brand new Italian Premium Tier VIII medium tank Progetto M35 mod 46 for free, if they complete 10 missions. Today, we got the missions added in-game and all its rewards! The marathon will start on April 13th and end on April 27th, across EU, NA and APAC (SEA) servers. Players will face a new type of marathon with the classic experience grind, but this time you will also be able to use your own skill to complete each stage. Please note, you only have to complete one condition or the other to complete the Stage and move the next Stage. For example, to complete Stage I, you need to either accumulate 5,000 base experience with any Tier VI+ vehicle or achieve a High Calibre Medal in a Tier X vehicle and you will move to Stage II. Conditions Obtain the “High Caliber” award 1 time. Available only for Tier X vehicles. Conditions Earn a total of 5,000 points of base experience. Only experience for being amoung the top 10 players on your team by experience earned on Tier VI-X vehicles is counted. Conditions Block at leat 4,000 HP of damage 5 times. Available only for Tier X vehicles. Conditions Earn a total of 7,000 points of base experience. Only experience for being amoung the top 10 players on your team by experience earned on Tier VI-X vehicles is counted. Conditions Finish the battle as the top player on your team by damage caused 5 times. Available only for Tier X vehicles. Conditions Earn a total of 15,000 points of base experience. Only experience for being amoung the top 10 players on your team by experience earned on Tier VI-X vehicles is counted. Conditions Earn at least 850 points of base experiene 10 times. Available only for Tier X vehicles. Conditions Earn a total of 30,000 points of base experience. Only experience for being amoung the top 10 players on your team by experience earned on Tier VI-X vehicles is counted. Conditions Block at leat 4,000 HP of damage 10 times. Available only for Tier X vehicles. Conditions Earn a total of 35,000 points of base experience. Only experience for being amoung the top 10 players on your team by experience earned on Tier VI-X vehicles is counted. Conditions Obtain the “High Caliber” award 5 time. Available only for Tier X vehicles. Conditions Finish the battle as the top player on your team by experience earned 15 times. Available only for Tier X vehicles. 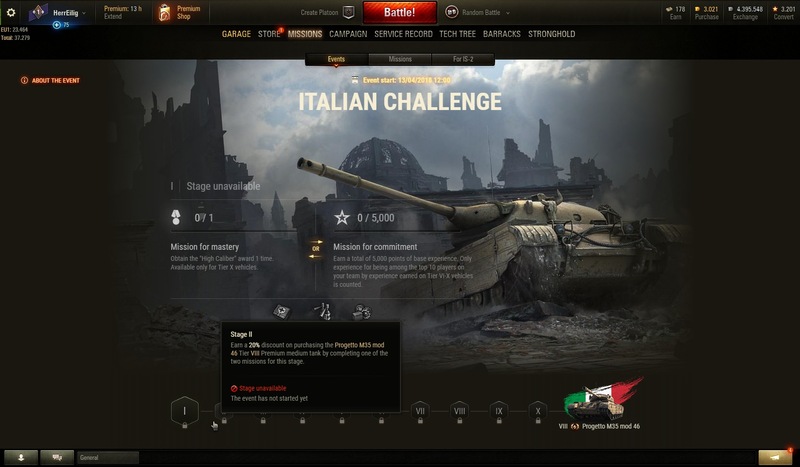 Rewards Unique Italian Style: Includes Camouflage and Emblem. Conditions Earn a total of 40,000 points of base experience. Only experience for being amoung the top 10 players on your team by experience earned on Tier VI-X vehicles is counted. Conditions Finish the battle as the top player of your team by damage caused 20 times. Available only for Tier X vehicles. Conditions Earn a total of 45,000 points of base experience. Only experience for being amoung the top 10 players on your team by experience earned on Tier VI-X vehicles is counted. Conditions Earn at least 850 points of base experience 20 times. Available only for Tier X vehicles. Conditions Earn a total of 50,000 points of base experience. Only experience for being amoung the top 10 players on your team by experience earned on Tier VI-X vehicles is counted. Conditions Finish the battle as the top player on your team by experience earned 20 times. Available only for Tier X vehicles. How much time player has for completing all 10 stages? Are you sure .. I hope you are right. Yes, you can start a new stage as soon as you finish the previous one. It will end on April 27, so 14 days. Yes they do. Let’s imagine, you are playing Tier X and you already have 2,400 XP in that counter, and you manage to get the High Calibre. You get to Stage II and the counter resets to the new amount. So you complete the Stage once you achieve one condition or the other. I highly doubt that’s the case. You can only start the next stage once you’re done with the current one. Furthermore, there are a few consecutive stages (e.g. IX and X) where the second condition requires the same amount of base exp, therefore – according to your thesis – upon completion of stage IX’s second condition, you’ll automatically complete stage X’s second completion, which would be silly – to say the least. 312000 base XP. And/Or watching Armies of Mauses bouncing happily on each other. While I really like the opportunity to get tank ‘for free’, I am always bewildered, if Wargaming did not see all the abuse beforehand. Maybe I will just enter tier X matches just for the giggles ! No, it doesn’t overlap in that sense. What I meant is that you don’t need to get for example 5,000 base XP to unlock the next stage of XP. I like how you just assumed it to be the case without thinking about the possibility of WG doing this :). Anyone can do 50k in a weekend easily. in a week end …not a day !!!! “How to ruin tier8 matchmaking for 2 weeks” – Marathon; since everyone with half a brain will realize that if they play tier X tanks, they can complete one of the 2 parts of a certain Stage faster. I think you can survive two weeks of playing without the conditions that you think are ideal. You assume that it won’t then start another 2 weeks of some other mission set for some other reward. In fact, I do not see problems with marathons and missions. I like them. Sometimes, I’m not even in the mood to play, but an ongoing mission is something unfinished, and I feel compelled to play. Missions are not the problem. What kills a game is the doldrums, the inertia, the boredom. On the other hand, tier 8 lights in tier 10 matches will get a fair amount of XP (on the right maps, obviously) if played well. Anyway, tier 8 MM is already ruined, with 80% of battles being tier 10, so this marathon will not change a thing. So only for players who have the Object 268 V4? Indeed, the damage dealing and blocking conditions are quite easy in a 268 v4. Too bad I only have paper tier Xs. Well, I read Haronnens comment quite differently. I suppose that, if you finish Stage I by obtaining 5000 base XP, you will start Stage II with zero XP. Only if you finish a Stage by reaching the ‘gameplay’ goals, your accumulated XP will be transferred to the next Stage. No. The XP is never transfered. Sorry if I didn’t make that clear. Once a stage is complete, the XP always resets to ZERO. How many days do we have to do the missions? and if I finish stage 1 on Friday 13, can I start the next stage immediately or I have to wait until Sat 14th .. and so on. That’s 1.7 million credits. So it appears you are “terrible at maths or noticing things”. Here’s an example: https://i.imgur.com/0xB7mQn.jpg The XP will reset if you complete the “Skill Based” part. So for each Stage players will have to complete either the Skill based mission or the amoung of base XP required. Hi again! I have to questions.1 The missions must be completed only in random battles?2 The xp can be earned only in victorious games or even the defeats counts? Regards! And how long will last? Not sure about Randoms, but I believe its only Random. More details should be published today about that. It’s either WIN or DEFEAT. as long as you are in the Top 10 of your team for experience. I suppose that, as in previous marathons, we’ll be able to buy tokens for the missions that we’re not able to complete? At least I hope so, considering the crazy amount of time that getting 312,000 base XP would take (and I don’t have a tier 10 were I can get those required performances consistently, apart from maybe blocking damage). You’ll get 10% of with every stage you complete. So you don’t have to pay the full price. Will have purchased stamps for missing missions? How was WZ and other events? There are no missing missions. YOu cannot skip, every stage gives you 10% discount. So it says base experience, that means no bonus from premium account or exp reserves? Yes, no bonus at all. Just base experience, if you win or lose as long you are in the Top 10 of your team. Guys will the personal reserves helps us finish the mission by getting more exp from the challenges and complete it? To do this with XP, assuming an average of ~600 base XP per battle, is almost 40 battles a day, every day, for two weeks. wonder what tanks are best for base XP? This is the sensible way of looking at this. Obviously there are some players who will be able to do this far more rapidly but for the most of the player base this is another job. Amounts to 56 hrs + of tanks in the 2 weeks. The package is very similar to the big package on RU and that costs 60 Euro (about $75). Now RU is usually cheaper than EU or NA so I would expect the package to come in at around $100 USD. If your time is not worth much then do the grind, but seriously how long would it take you to earn $100? The issue is that Wargaming knows that most of its player base is older and has cash, so they won’t make this cheap, and they won’t make it too expensive either….and they will watch the $$$ roll in when people get close and cannot finish the missions. How much does bundle cost on US server or any other server? Hoo boy… Imma have to grind a lot… Well, if we can complete multiple stages per day, that makes it easier. Good luck to anyone without a tier 10 tank heh…I hope my Obj. 260 will be good enough for some of these. just because the answers dont seem straight and there is alot of arguing if I only did the XP part how much xp is needed 300k+ or 50k? Not surprised. This set of missions is just like the other “marathon” missions from Wargaming World of Tanks. Nothing is given out free. Thanks for showing the mission requirements. The first two missions are easy, but then it escalates quickly. 312k base xp in 14 days. That’s very grim. Far too much work for a pixel tank. A grindfest for the non-lifers. If the missions were easy I would consider start playing again, but this is anything but easy missions. For me it is not about the money. I could buy the tank, but I really don’t care. This will not jumpstart me into the game. I have not played this game since last October, and I see no reason to start up again. Now back to the much more friendly World of Warships. No, its was a typo. anybody having an issue with mission marathon not showing in the garage? I’m getting an error line when clicking on the event, and can’t access my “score” in it at all. Still, when going to WG shop into special Progetto page, I have a discount of 10% shown, as I clearly did achieve the 1st rank of missions.